Janet Clarey's recent post On Growing Facial Hair is right up my alley of interest. But frankly, I have nothing interesting to add to the conversation. In fact, I've had very little of interest to add to any conversation of late, mostly because I'm much more focused on my personal life and the many transitions I'm handling there. 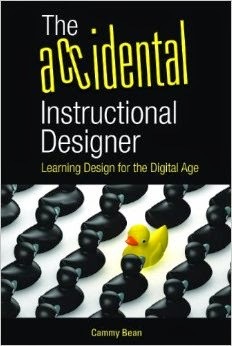 If I were to blog it all, we'd be WAY off the topic of instructional design. But personally, I like the personal. And yet, I also like my boundaries. My 3 and 5 year old kids are at the end of their first month of Montessori school. I'd love to apply Montessori principals to eLearning instructional design. My son is really into his Wii. We've had to find some more age-appropriate games than Super Smash Brothers and the like. Recently discovered Endless Ocean. You're a scuba diver exploring different dive spots in a fictional spot in the South Pacific. Awesome experiential game. Kind of like Second Life in how open the environment is, but there are challenges and a bit of a story woven into that keep it a game. Plus, swimming around with whales is really cool. So. This is me trying to get my blogging energy back. Hey Cammy, blog about your son's playing the Wii, trust me that is related to instructional design and the future of e-learning. Hey Cammy--you know me, I think you can always apply the personal to the professional, so I'm with Karl that you should blog about the Wii. I also want to hear about how we could use Montessori for grownups. I think there's a lot that would apply. For me, the personal in blogging is like a conversation on the airport shuttle. I might have a specific audience in mind, like my seatmate, but I can't control who else might be listening. So I'm pretty open to talking about things that interest me, stuff I've learned, even if it has origins in personal parts of my life. But I have limited, and I'm generally conscious of them. I'm not open to talking about current clients by name, for example, especially since I often work in partnership with others -- so the client isn't mine alone. I might talk about something in a phone conversation or a one-to-one email that I wouldn't dream of putting on my blog or into a comment. If one of my friends or colleagues is a compulsive blabbermouth, I probably know that. Blogs by definition are blabbermouths. I've had the disconcerting experience of a blogger misinterpreting a comment I'd posted; the blogger immediately invited others to help me accomplish something I hadn't expressed any desire to do. That got cleared up quickly, but for me it's a striking example of an online presence becoming far more personal than I cared for. Blogging re: the Wii and Montessori -- requests duly noted! The real challenge here for me is balancing work & web 2.0 & family 3.0 (3.0 kids that is). Dave, I love your analogy -- blogging as airplane conversation. And yes, we are all blabbermouths (even those among us who are self-proclaimed introverts). Actually, Cammy, it's the blog that's the blabbermouth -- it never shuts up, unless you take it down, and even then someone will find an echo of it somewhere. So blogging is a bit like using a cash card, rather than actual money. You'd think it's the same, but it's not. Imagine have $25 on your Starbuck's card. You go for coffee with a friend. You're likelier to buy an upgraded drink, or to pay for both, than you are if you used old-fashioned money. That's just human nature. So in a small blogging community (you recognize the names of lots of the commenters), you have a sense that you're among friends and can speak freely. And you can -- you're just unaware of how what you say can appear out of context.